For Washington to show leadership on climate change and build support for costly new carbon-reduction programs, the state must do a better job explaining how they’ll affect taxpayers. The lack of clarity around costs is painful as the Legislature weighs four different proposals to reduce emissions — a carbon tax, a low-carbon fuel standard, a requirement that utilities phase out fossil-fuel energy sources and a cap-and-trade system requiring large polluters to cap emissions or buy credits to offset them. Before finalizing any such policy, the Legislature must explain which provides the biggest bang for the buck. It should also consider investing in a robust, nonpartisan economic analysis program to help members and the public better understand the ramifications of major policies. Global warming is a crisis, and the majority of voters want government action. But to build lasting support — and avoid a Tim Eyman-style backlash — policymakers must be transparent and forthright about the substantial household costs involved. They could start with a common metric, such as the cost per ton of carbon emissions reduced. Knowing this for each policy option would help legislators and the public decide on the best approach. Analysis of social costs gets complicated. People in dense cities are less affected by fuel costs than those in rural areas, for instance, and energy cost burdens are greater for lower-income households. The social costs of carbon pollution have long been estimated by federal agencies, to analyze policies, but are still debated. Still, with basic price information, such as the increased cost per gallon of gas or kilowatt of electricity, people can evaluate how state proposals may affect their situation. Pricing fluctuates, but the office estimated the clean fuel standard increased gasoline prices 13 cents per gallon last year and will add 46 cents in 2030. That effect is comparable to Initiative 1631, the carbon-tax proposal Washington voters rejected in November, which would have increased energy costs statewide more than $1 billion a year. Analytical work is happening backstage in Olympia as legislators, Gov. 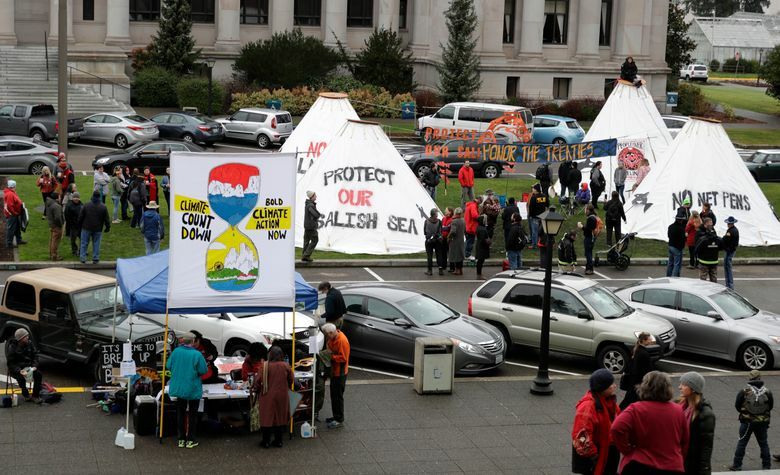 Jay Inslee, analysts and advocacy groups pursue climate proposals. But public policy discussions continue to be heavy on emotions and light on cost details. At a minimum, legislators should know what these policies might cost state government. For instance, the State Patrol buys lots of gasoline. If the low-carbon fuel standard championed by Inslee and Burien Democratic Rep. Joe Fitzgibbon, House Bill 1110, adds 13 cents or more per gallon, the patrol will need more funding. Yet the state’s fiscal analysis of HB 1110 says nothing about potential fuel-price impacts on government and taxpayers. It details just administrative costs, of $750,000 to $1 million a year. The bill does call for a cost-benefit analysis — in 2027, long after it’s in place. During floor debate, State Rep. Morgan Irwin, R-Enumclaw, added a requirement that the state annually report per gallon costs. But that, too, begins after the policy takes effect. A proposal to know beforehand what the state is getting into was rejected by the Democratic majority. Auburn Republican Rep. Drew Stokesbary called for a more detailed fiscal impact analysis before the measure takes effect, but it was voted down 55 to 42. “I would love to have the conversation where we’re just looking at facts and what’s the most efficient way to reduce carbon output,” Stokesbary said afterward. Stokesbary said there are proposals to upgrade fiscal notes and he’s working on budget process reforms, but that may be too late for a Legislature hellbent on finally passing Inslee climate measures, now that he’s running for president. Inslee’s candidacy is a good opportunity to make climate change a top priority in the 2020 election. This would be an even stronger platform if opposition to Inslee’s previous climate proposals in Washington state was overcome with transparency, education and consensus building.